It was a choppy earnings season but despite its volatility the bull trend remains very much intact. The Dow Transports and Dow Industrials both are trending upward with higher highs and higher lows and both indices are in congruence. (Though it must be noted that the Transports Index is significantly stronger than the Industrials). In addition The VIX remains at historically low levels and the Advance/Decline line shows no sign of any technical stress what-so-ever. Despite this strength there are some specific areas of weakness. One sector experiencing difficulty is technology. It would appear the gloss has definitely come off silicon valley. Review the charts below of Facebook and Twitter. This weakness is asking questions of this industry going forward. If a solid recovery is safely in place these media poster-boys should be “booming”. The chart evidence presented proves they are not. I think the issue here is overvaluation and the inability of future income streams to validate exorbitant P/E ratios. This technological weakness is not company specific. The NASDAQ is indicating real technical weakness. The chart below of the QQQ’s shows that the index is hovering about its 100 daily moving average. If the price action breaks below this important average and then fails to consolidate around the 200 daily moving average (which is only 5% lower), it will be very worrying for the sustainability of this bull market, long term. Another area of weakness is bio-tech which has technically entered a bear trend. While there has been a 15% retrenchment from previous highs in the bio-tech ETF: IBB, I still anticipate further correction. As suggested in last month’s brief the consumer staples sector (ETF: XLP) has had a positive season. This I believe is due to rotation by astute money managers into markets offering earnings consistency. The consumer staples bear trend, which began last autumn, is definitely over. In the general “blogosphere” for the past 2-3 months there has been numerous stories heralding the “collapse” of the American real estate market. While these articles make for interesting reading they are somewhat sensational. The market confidence in this sector remains strong as can be observed by reviewing the Dow Jones Real Estate Index Fund ETF: IYR below. This year this ETF is up 11% and technically the trend is powerful. I think this is one of the reasons the FED is continuing with the QE tapering policy. I think Janet Yellen and her team are genuinely confident the recovery has legs. Of course should this strength become too robust it will call into question the continued low interest rate environment. Of course when that mantra begins to be played out in the media all bets concerning future market trend will be off ,from my point of view. But that is a discussion for another day. Dow Jones Transport Index: Daily. A/D: Advance Decline Line: Daily. Power Shares ETF: QQQ: Daily. Consumer Staples ETF: XPL: Daily. Dow Jones US Real Estate Index ETF: IYR: Daily. A couple of months ago I was doing some research for an article on world economic instability. One of the surprising facts I discovered was that nearly 15 trillion dollars of cash resides in off-shore tax havens ranging from Bermuda, The Virgin Islands, The Isle of Man, Jersey, The Grand Cayman Islands, Panama and (surprisingly) Ireland. 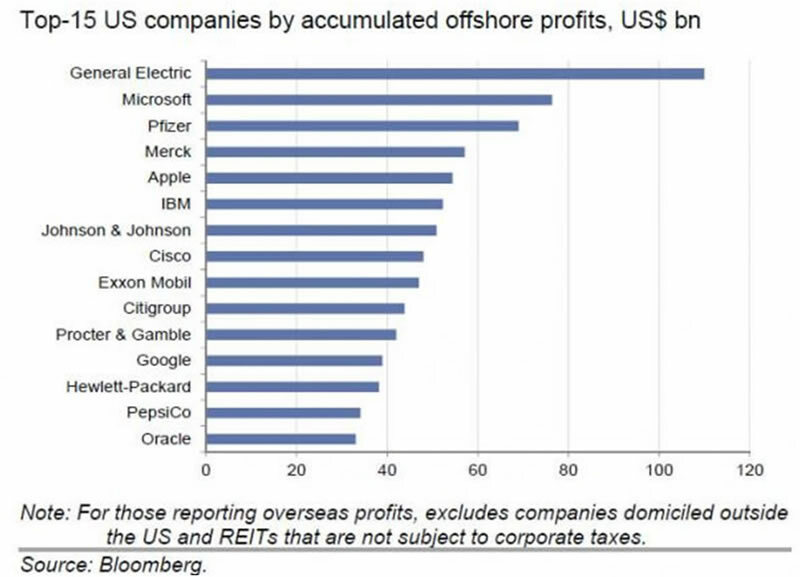 This “off-shore” reality is greatly motivated by the fact that even though the American corporate tax rate is officially 35% approx., “international” branches (affiliates) do not pay this tax until profits are repatriated. In the main most of the American Fortune 500 earn the majority of their income internationally, thus in the main they pay no corporation tax on the majority of their revenue. Very often these trillions of deferred interest free tax loans remain “abroad” until “tax amnesties” are arranged. Under such amnesties the 35% rate can be adjusted down to the region of 5%. (Reference: 2004 Bush tax amnesty “Homeland Investment Act”. The adjusted rate was 5.25%). Such “amnesties” make a mockery of the official American corporate tax rate. If these corporations paid the real corporate rate, billions of additional taxes could be collected to greatly improve America’s fiscal balance sheet. This would allow much needed revenue to be invested in such areas as infrastructural development. This type of executive action would ensure that real jobs were created on the American mainland; jobs that play real wages not subsistence stipends. iv) the outright use of offshore funds to buy offshore companies such as the GE-Alstom deal which bypasses the US treasury entirely. Two questions emerge: who has the most offshore cash, and who is most likely to be the next US corporation to engage in one or all of the above listed transactions which merely seek to optimize a company's offshore cash holdings. I think this matter of “un-repatriated” taxes is going to become more and more an issue as main stream media begin to pick up on it. Surely something is wrong when Federal America has an official business tax rate of 35% approximately; a rate which is applied aggressively to land based mom and pop small businesses, yet is never applied to the multi-trillion corporate sector.